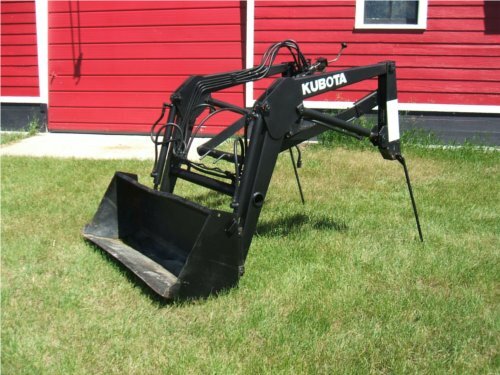 If you have a Kubota, or any tractor, equipped with a front end loader, sooner or later you will find yourself wanting to remove that attachment. The job is straightforward and only takes 5 minutes after doing it once or twice. There is no excuse if you have been putting off service work (oil change?) because of a potential hassle getting that loader removed. A front end loader not parked in a very practical location. For most loaders, including the B1630 pictured on the Kubota B6200 below, there are three attachment points from the loader to the tractor. The first two are on the left and right tower columns that form the back of the loader and attach at the tractor mid-frame. The third attachment point is the bar and saddle that is just behind the bucket and mounts to the front of the tractor’s frame. 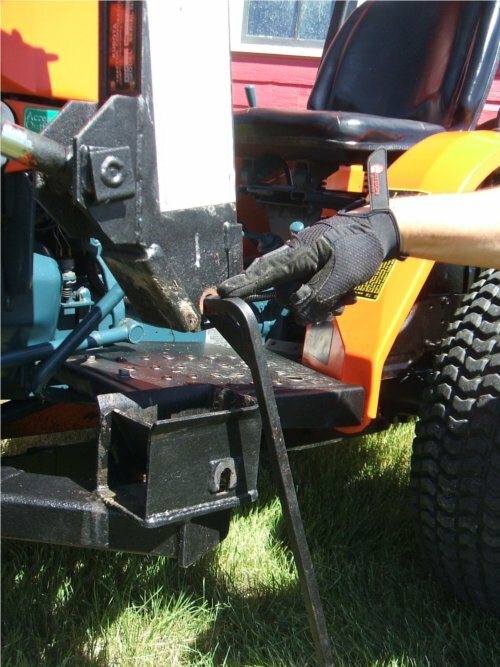 Removing the loader will involve undoing the bolts and nuts from these connections as well as disconnecting all of the hydraulic lines that power the bucket and lift arms. 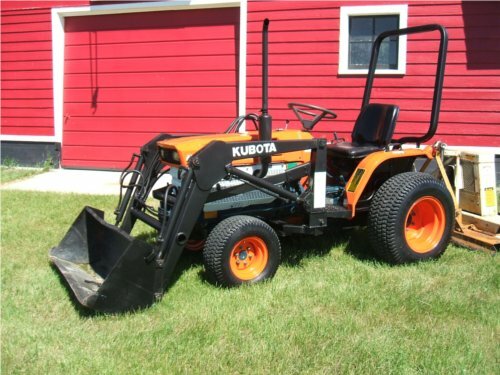 A Kubota B6200 with a factory B1630 front end loader. You will be backing the tractor out from beneath the loader so consider this when choosing the location. Loaders are very heavy so it is unlikely that you will be able to remove the loader and then carry it away to a more suitable place – where you drop it is where it stays. Try to pick a spot that is firm, level and not a high traffic location. You do not want people or animals bumping into a parked loader. Pull the tractor and loader into the park area straight-on. Do not have the wheels turned. Lower your loader bucket to the ground and turn off your tractor. You want the top of the loader frame to be as parallel to the hood of your tractor as possible – it will make lifting up on the tower columns easier in a moment. The first step is to undo the two wedge pins that hold the left and right tower columns to the middle of the tractor’s frame. For future reference, the tighter these bolts are turned the harder the wedge holds in place. You may find that you have to tap the last inch or so of the bolt back out the other side with a mallet. 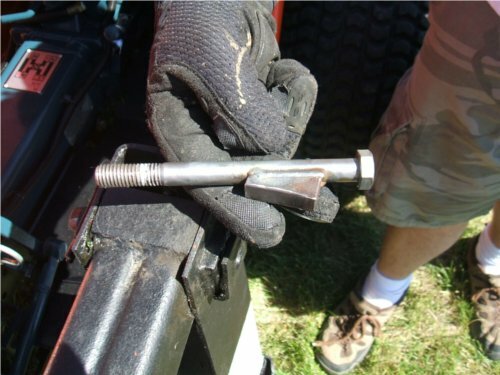 One of two loader wedge pins/bolts that hold the bottom of the tower columns onto the frame of the tractor. A ratcheting socket wrench makes quick work of these pins. 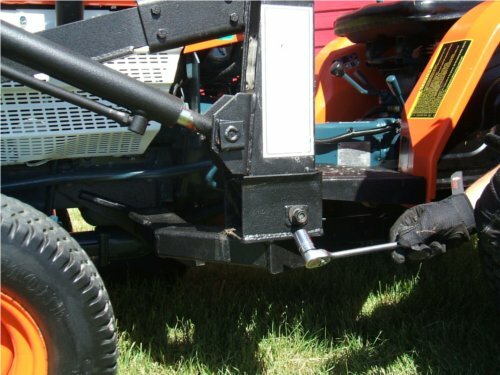 Next we want to move to the front of the loader and undo the two bolts holding the loader front bar to the saddle mounted on the front of the tractor’s frame. If these are a bit sticky whack them with a mallet to get the started. 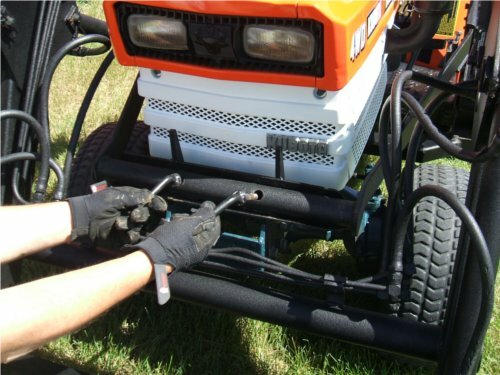 Remove the two bolts from the loader bar and saddle at the front. At this point there should be nothing holding the frame of your loader onto the frame of your tractor except for some hydraulic lines. Your loader should have two kick stands (bent rods) that will serve to hold up the tower columns. Our kick stands were attached to the inside of the left loader frame. The idea here is to lift the tower column and insert the kick stand. You do this with your own muscle. Do not power on the tractor and use the loader to do this in any way as it will not work. Having a second set of hands will help you. Each person goes to a tower column and lifts straight up. With your other hand push the kick stand in place all the way. The loader should now be resting on both kick stands. One of two kick stands in place at the bottom of the tower columns. All that is left is to disconnect all hydraulic lines feeding into the loader. 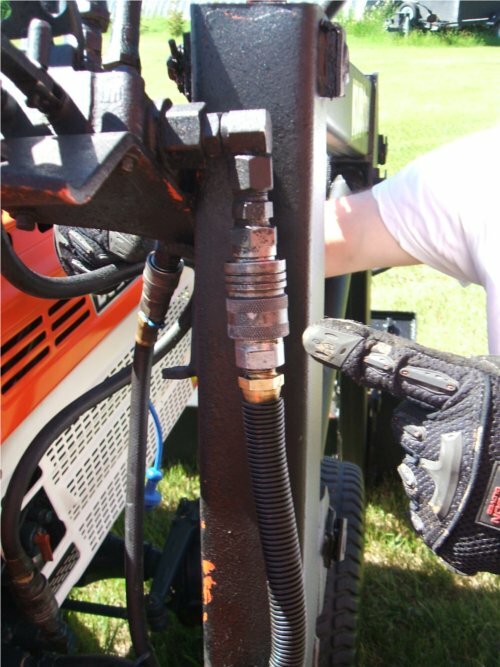 Before you begin, take a moment to push the loader joystick around a bit to take any pressure off the lines – if you do not you may get a face-full of hydraulic fluid when you undo the couplings. Your loader will likely have three lines – the hydraulic in that comes off the hydraulic pump itself, a hydraulic return line and a power beyond line. The couplings themselves are quick-disconnect, similar to what you would find on air-line fittings for an air compressor. To disconnect them push up and pull down the outer sleeve. Hydraulic return (left) and power beyond lines (right). 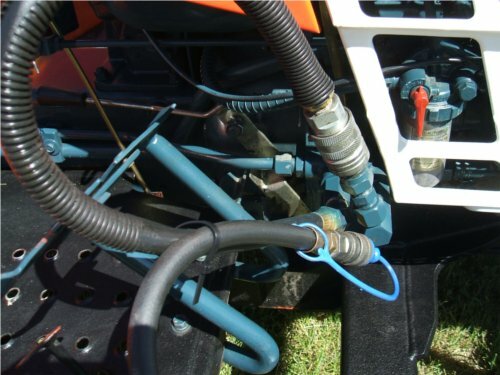 After all of the lines are disconnected be sure to close the hydraulic valve that diverts hydraulic oil from the tractor into the hydraulic in line. This valve should be close to where your in-coupling was disconnected and may even have a red handle like our B6200 does. We redirect the valve to make sure that the hydraulic pressure generated by your hydraulic pump is not up against your quick-connects that are now exposed. We have disconnected the hydraulic in for the loader. 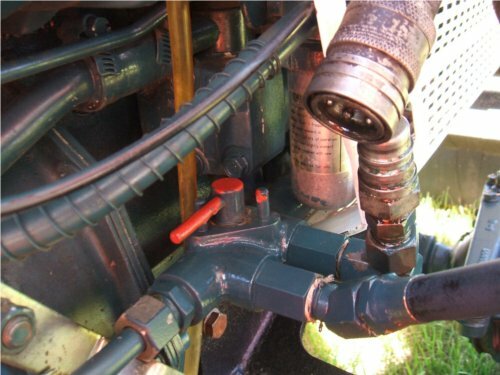 Also note that the red-handled hydraulic valve is in the closed position to take the pressure off the quick disconnect couplers. The loader should now be 100% disconnected from the tractor – frame and hydraulic lines. Check the front tires are straight and slowly back out from the loader. Backing out to leave the loader parked in place. Before moving onto the next project we should tidy up and protect the loose ends of the dangling hydraulic lines. You can take the power in line and circle it back onto the exposed hydraulic in quick connect. The power beyond line can be capped with a hydraulic end-fitting (purchased for a few cents) and then tie-strapped to the other line to keep it out of the way.